Hi guys, sorry about this... lol, but I'm finding the Mini forums to be pretty dead so am left days waiting for answers! 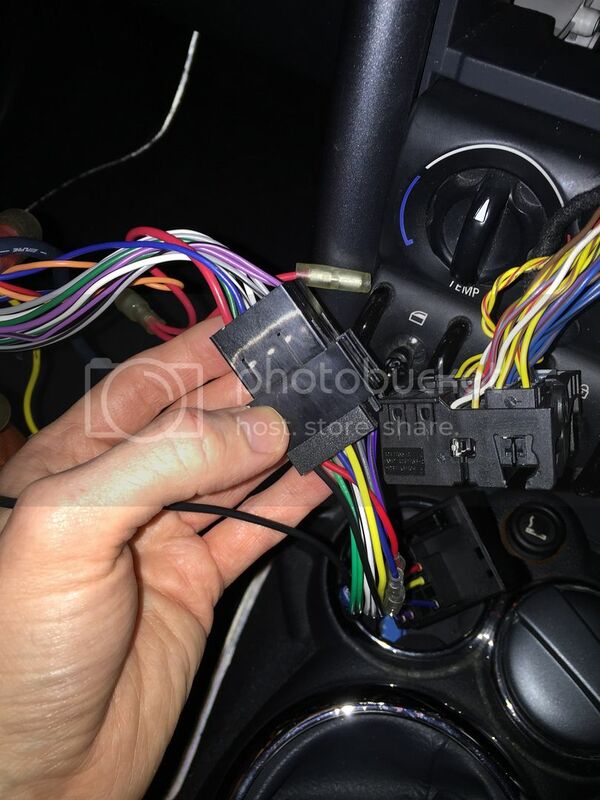 I bought the appropriate ISO adapter from Halfords today to wire up an Alpine headunit. There was only one type and it looks like it's going to fit perfectly. However... the pins it needs to connect to are blanked off with some weird blue thing! Am I meant to remove this? I tried doing it but it seems like I'm really going to have to force them off. I'm worried about breaking them in case I need to put them back or am barking up the wrong tree! It doesn't have the HK sound system by the way, which I know can cause problems. If those blanking blue bits come off, it'll connect up... all the wires go into where those blue bits are. Nah I did try getting them out using a small screwdriver but to be honest they weren't really budging... so am worried I'm going to have to snap them to get them out. Oh well I'll give MiniTorque a couple more days to see if anyone's done this then just do iiit. I should have taken a picture from above as well. The left one looks like that's possible, but the right one's sealed up. Okay well it definitely wasn't going on before... I did eventually manage to remove the left one by sliding it up with a small screwdriver. The right one I had to snip out with wire cutters, but there you go! However... no power. I read a few people on Amazon reviews saying the adapters wiring doesn't always match up to the ones in the Mini. I take it red is power? Well the Mini one is red and some other colour combined, and yeah, it doesn't match up. Long shot but anyone know of an online diagram!? It needs a switched live too I.e one that is live when the ignition is on, original radio uses canbus to switch on with ignition. So I can go purple/blue to blue on the adapter, and red/brown to red on the adapter. However seeing as though the Alpine headunit goes from the unit itself to an Alpine adapter, then the ISO Mini converting adapter then to the actual Mini wiring (phew) I think, if possible, I'd be better off moving the Mini wiring; then I'd only have to change one set of things round... wondering if I can just a couple of safety pins in there to make sure it all works before I continue? 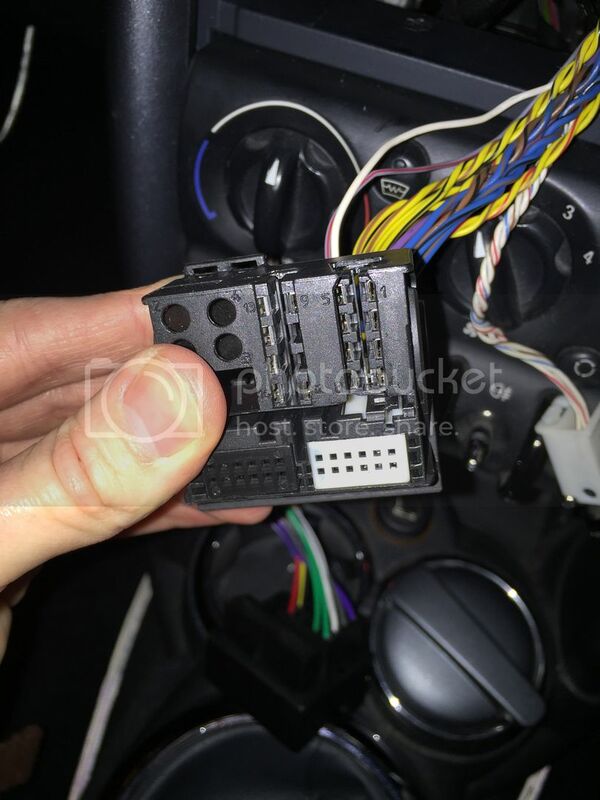 If a switched-live is available on one of the pins of the Mini harness (but on the wrong pin etc), then i would keep the Mini harness intact and make the changes to your Mini-to-ISO adaptor - that way you can revert back to the original headunit with minimal fuss. It's not a new headunit btw... predates my very first car! Brilliant little thing though, bought it in 2003 and it's been in every car I've owned since! Going off that pin-out link you gave - pin 1 (white) and pin 2 (grey) are remotes; pin 3 (red/brown) is live; pin 4 (purple/blue) is switched live; pin 8 (brown) is ground. Although pin 5 doesn't seem to match up being white/grey - possibly illumination. So on the ISO block (no idea on pin-outs) it should be, red is live, blue is switched live, black is ground, yellow is illumination. 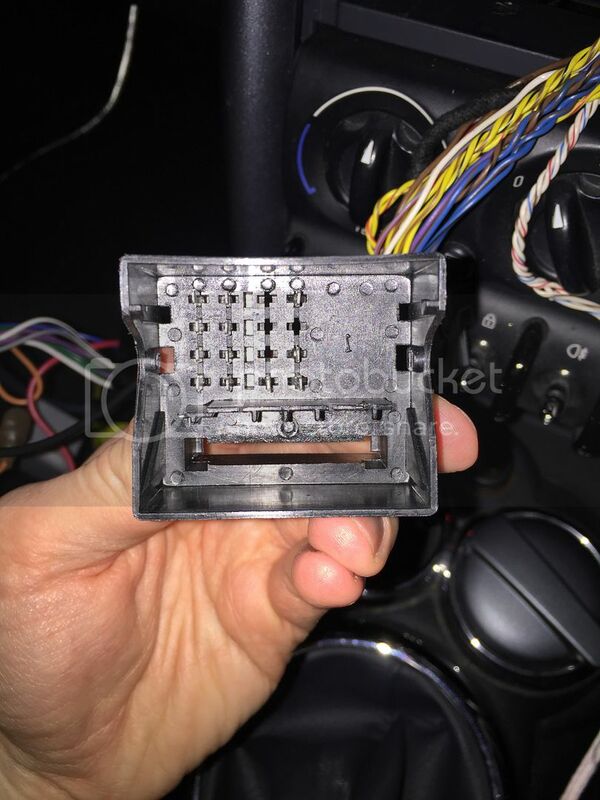 However, i'd grab the pin-out of your headunit (they're usually in the manual) and then trace it all back (label it up if need be). Anyway done this 'properly' today as in wired in the live, switched live and ground... nothing. 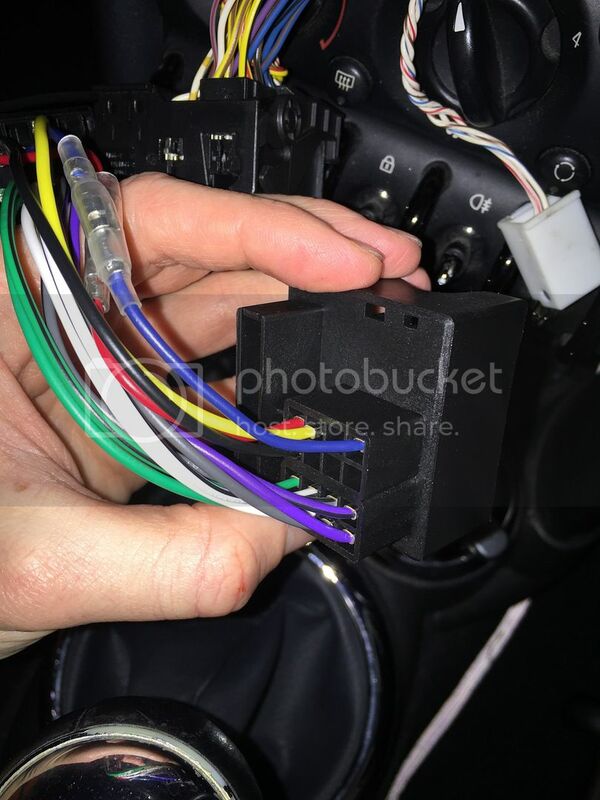 Decided to just bypass the adapter altogether and wire it directly into the headunit wiring still nothing! 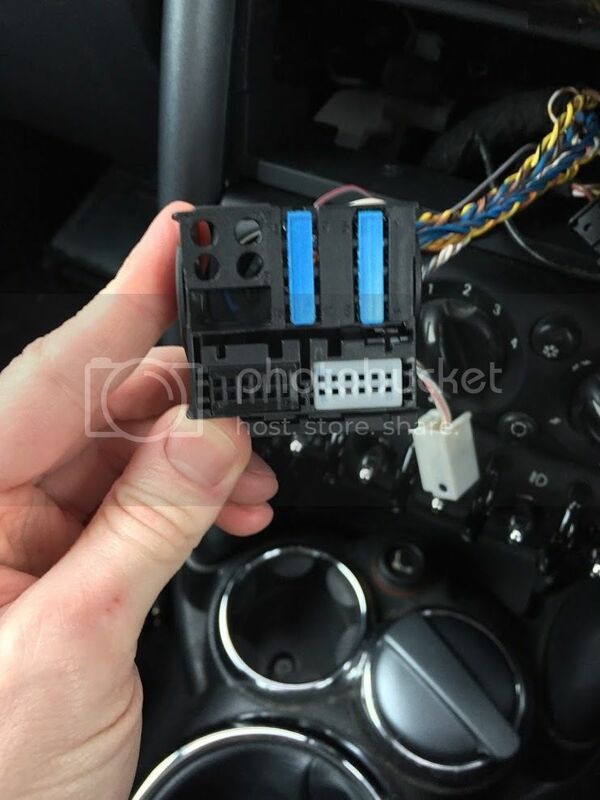 Is the above actually all you need to get some power to the headunit? Or are the other ones you mentioned, i.e. remotes and illumination required as well? All you need is live and ground. The headunits switched live needs to be connected to power but it doesn't necessarily need to be a switched live, rather it could be permanent live. Is the headunit working? Has the fuse blown? Might be worth checking on a bench with a power supply or battery Similarly, are you sure you're getting power at the mini's harness? Again, using a DVM/volt meter would help you here. 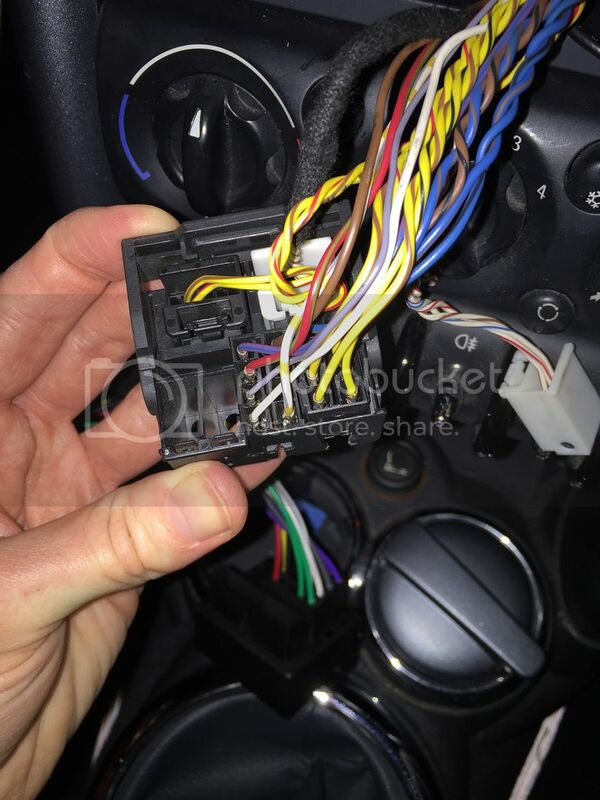 Headunit was taken out of my Clio before it sold last week - working perfectly. Mini stereo works perfectly too. I do have access to a power supply workstation at work... but can't really see how it would have gone! Very strange. What are you looking for with a meter; that there's 12v on the red? What are you looking for with a meter; that there's 12v on the red? That the pinout you found is correct, ie - 3 is live, 4 is switched and 8 is ground, and there isn't something fishy going on. But it's worth checking your headunit and the fuse, just in case. Why are you changing the heady it anyway? There's literally nothing wrong. With the original one. Can you install an amp and sub to it? That's the only reason I guess, plus my Alpine headunit can read MP3 discs which is quite handy. You can install them to the standard unit. Also, the standard unit you can fit an aux cable. And I don't know if it will read an MP3 CD or not I never tried?